Dr Preeyan Patel graduated in 2010 from the University of Birmingham. Following this he completed his Foundation Training with the Oxford Deanery at Eastgate Dental Centre. Preeyan continues to treat existing patients at Eastgate Dental Centre, Aylesbury (until the end of August 2015). Preeyan is the most recent addition to the team at The Old Rectory He will be treating both new and existing patients in his new appointment. Preeyan has always been keen to keep up to date with best evidence-based clinical practice. 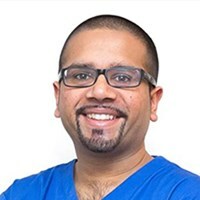 In 2013 Preeyan took the opportunity of completing the Certificate in Restorative Dental Practice (UCL) with the prestigious Eastman Dental Institute. In February 2014 he successfully was accepted to join the Membership of Faculty of Dental Surgeons with the Royal College of Surgeons, Edinburgh. Preeyan has started his Speciality Training in Prosthodontics (StR) at the Eastman Dental Institute at the Eastman Dental Hospital, London. With this training he hopes to provide higher quality care and more specialised services for the patients he treats.